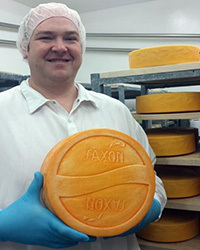 Saxon Creamery began making two cheeses from a single herd in 2007. This echoed the farmstead tradition of cheese made by many farmers in the 19th century. To connect with this tradition, Saxon Creamery's name is derived from the founding family ancestral home in Saxony, Germany. The single source of rBGH-free milk used to make Saxon Creamery cheeses is provided by the Saxon Homestead Farm, a sixth-generation family partnership-owned farm that shifted to a pasture-based herd in the 1990s. The farm is dedicated to creating high-quality milk from the environmentally friendly rotational grazing of its dairy herd and also provides a high level of cow comfort and animal well-being. Today, Saxon Creamery award-winning cheeses are made from pasteurized milk to provide a consistent product. We take pride in handcrafting artisan cheeses with quality ingredients established on the principles of sustainable, environmental management of the land with a team of cheesemakers and individuals who are proud to handcraft and sell the Saxon Family of Award Winning Cheeses every day. Our cheeses have been recognized with placement ribbons throughout the state, the United States and the world. Over the last five years, Saxon Creamery has invested in continuous improvement processes including sustaining a commitment to being a certified Safe Quality Foods Level 2 facility. We are annually inspected by State, FDA and USDA agencies. Eric Steltenpohl began his career working with cheese in 2001. Over the years, he held various positions at a few different companies and also got his Cheesemaker and Pasteurizer license at the Center for Dairy Research at the University of Wisconsin in Madison. He was always looking for that perfect opportunity to really showcase his skills and knowledge, and he found it with Saxon Creamery in 2014. At Saxon, Eric learned to handcraft European Style Artisan Cheeses. Eric is responsible for day-to-day operations, production of the current makes, and working on developing new products. In 2015, Eric became a SQF Practioner and in 2016 became a PCQI after completing an FDA-approved course. Eric has dedicated himself to improving and maintaining safe, quality cheeses and plans to become a Master Cheesemaker in the future. Saxon's signature cheese, Big Ed's Gouda is the cheese that hugs you back. It's creamy, smooth texture is sweet. The rich milk flavors make it the perfect table cheese. These flavors are enhanced when generous slices of Big Ed's are tucked between bread and grilled, or blended in warm dishes. The 90-day aging process takes wheels of Big Ed's through three aging cellars, controlled for temperature and humidity, where the unique flavor characteristics emerge. Great for boards, appetizers, shredded over salads, or cream-based sauces, and it melts well. Asiago Fresca shares a mild, pleasing taste. This cheese has a delicate, smooth, open texture, presenting a fresh, creamy milk flavor with a slight citrusy tang. With a creamy, smooth texture, Asiago Fresca is a perfect melting cheese. Place chunks on pizza, stir into pasta dishes, or serve it as an appetizer. Its versatility enhances a wide variety of dishes. Behind the scenes, Asiago Fresca is handcrafted in the vat, gently pressed, and placed in brine tanks. Over 4 to 6 weeks, the cheese wheels are rotated through three different aging cellars to develop its special flavors. This is a rich, full-body aged cheese with a creamy texture. It has sweet and nutty flavors reminiscent of Alpine cheeses. Lingering Swiss notes make this a true Wisconsin original. Saxony is the perfect partner to soups, crackers and hearty breads. Saxony's flavors play well with a range of foods. Pair it with hot peppers, toast it on bread, or toss it in pasta salads. Its versatility lends itself to a mild red like Beaujolais cru, or a crisp, dry white like Sancerre. Saxony also plays well with malted and hoppy beers. Using Saxon's signature cheese, Big Ed's Smokehaus Gouda presents that elusive balance sought after in smoked cheese. Each handcrafted wheel presents a rich deep cream color with marble like veining in the cheese. This smoky version of Big Ed's Gouda has a balanced cherrywood smoke flavor with hints of butter and sweetness. Unlike many other smoked cheeses Big Ed's Smokehaus is a great melting cheese that compliments burgers, pizzas, and salads. Consider pairing with a whiskey flight or crisp light beers to unlock the smoky notes of this award winning cheese. During late fall and early winter, the single source herd produces a unique milk, high in protein and cream. With this limited-availability milk, Saxon handcrafts Snowfields Aged Butterkase, aging it six months. The cheese wheels rotate through three aging rooms, from winter through late summer, to develop its unique flavor characteristics. This cheese has rich, creamy texture with flavors of sweet milk and Parmesan notes. Sometimes you may even get a little crunch from the lactic acid crystals that form during the aging process. Enjoy Snowfields with crusty, hearty breads and soup. It's also great served with aged lager beers and dry wines. Saxon Creamery Big Ed's Gouda with Serrano Peppers is a rich, young, buttery Gouda-style cheese that is warming things up everywhere. It's bursting with bits of Serrano Peppers, which deliver a nice warmth to your mouth and will have you coming back for more. This semi-soft cheese is great on sandwiches and bold enough to stand alone on a cheese platter. The rich milk flavors speak of the lush green pastures where the cows are grazed, the season in which it was made, the particular craftsmanship of the cheesemaker, and the time the cheese spends in the aging rooms. Every batch of cheese will have a story to tell. We hope you enjoy.